AT THE HOMESTEAD: LET’S MAKE SHAMPOO! So what do we do at Second Chance Homestead when we need a fresh and minty head of hair? Most store bought shampoos have creepy chemicals, dicey dyes, freaky fragrances, and long lists of ingredients that you can’t even pronounce or recognize! But not us at the Homestead. We like it lean and serene. To keep it clean, we go GREEN. We make our own natural shampoo out of natural ingredients in just three easy steps! Join the SCH beauty revolution! Watch this 4 minute film to find out how you TOO can make shampoo with built-in conditioner and nothing nasty added using Second Chance Homestead’s secret “nothing to question” recipe. It’s even PEPPERMINT SCENTED! 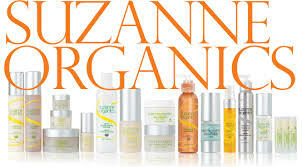 SOMERS’ FALLS FLAT ON HER (now) ORGANIC FACE: HOW STUPID CAN YOU GET? One of the things that disturbs me most is when certain B-list celebrities grab hold of concepts like “ORGANIC” and turn them into their cause celebre (and newest moneymaker) via marketing spin. A sucker is born every minute. But sometimes the sucker is being sucked by an even bigger sucker. Allow me to explain. Case in point. Suzanne “Sucker” Summers, who makes her home in the Coachella Valley and makes her money by exploiting every health and body craze that surfaces. Why is she a sucker? Because she believes her own press, and has bought into the propaganda put out on the right about the Affordable Care Act (read on). Before going into her views on “Obamacare,” let’s talk about her latest marketing endeavor. 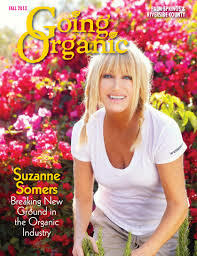 Here she is this month on the cover of GOING ORGANIC magazine, distributed widely for free throughout the Coachella Valley. I always note the irony of this publication because it’s printed on Glossy paper that isn’t recycled and doesn’t even break down easily in a compost bin. But that’s a different story for another time. And what is GOING ORGANIC magazine doing this month besides raking in cash from all of its’ advertisers and contributing to landfill waste with it’s used and unused copies? Why, it’s shilling for Suzanne Somers’ new moneymaker, a line of health and beauty products that capitalizes on the concept of organic. Oh no. Here she goes (blows). If it’s not the Thighmaster or another poorly written book, it’s going to be something to try and help you save face. Organically of course. She goes on to criticize the Canadian health care system because she is intimately informed about it since her husband hails from that country up north (remember him? Alan Hamel? 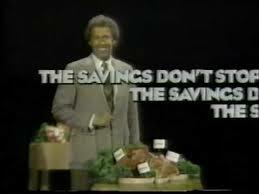 He used to do commercials for the ALPHA BETA supermarket chain back in the 1980’s. He isn’t just a ‘has been.’ He’s also a Canadian). Then she makes her first big blunder: she compares the ACA to the system in Canada as if they were one and the same. Canada has a single-payer system. The ACA just requires Americans to purchase insurance from private health care companies on an exchange. Apples and oranges, but it’s all the same fruit to this nut. To add insult to injury (and to push her “socialism” claim) she falsely attributes quotes to Lenin and Churchill, which the WSJ was forced to print a retraction for and correct online. Ooops! The final laughable moment comes when she laments that healthcare will be so unaffordable for seniors that they won’t be able to afford her new Organics line. She ignores the fact that seniors remain covered under Medicare, which IS a single-payer system just like the system in Canada she originally criticized. It’s a lot more “socialized” than anything the ACA will produce. Three might have been company, but with this kind of loony logic it’s starting to feel like a crowd. Come on Suzanne. Get a grip.